Procaine penicillin G’s fast action is enhanced with the long-acting properties of benzathine penicillin G, which is active during 5 days. The spectrum of activity is widened by the dihydro-streptomycin sulphate. 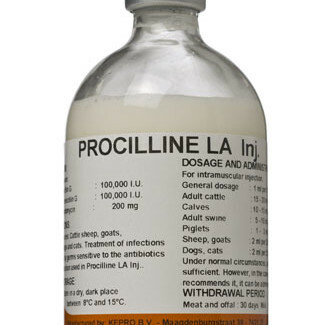 Procilline LA Inj. 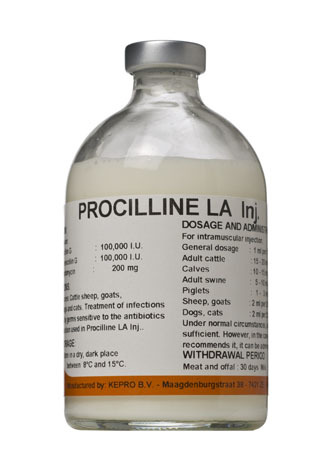 is indicated for treatment of infections caused by bacteria sensitive to the antibiotics combination present in Procilline LA Inj. in cattle, sheep, goats, pigs, dogs and cats. Do not administer to animals hypersensitive to penicillin or procaine, animals under narcosis. Do not administer to animals with an impaired kidney function. Cattle : 15 – 20 ml per animal. Calves : 10 – 15 ml per animal. Pigs : 5 – 10 ml per animal. Piglets : 1 – 3 ml per animal. Sheep, goats : 2 ml per 25 kg bodyweight. Dogs, cats : 2 ml per 25 kg bodyweight. Repeat normally after 72 hours. Your veterinarian can recommend a shorter interval of 48 hours in certain cases. Store in a dry, dark place between 8 °C and 15 °C.